...that Osiris was once the commander of the Vanguard, but was exiled by the Speaker? "Behold, Sister, the lie that makes itself true." "And thus the Ahamkara were made extinct, their call silenced, their solipsistic flatteries erased, their great design - if it ever existed - broken. Of this you can be assured, oh reader mine. " The Ahamkara are a mysterious and powerful species of shapeshifting creatures that first appeared in the Solar System after the Traveler arrived. The Ahamkara are believed to have originated from, or sent by the Nine to fulfill some purpose within the Solar System. However, it is believed that after the Great Hunt, the Nine seeked to utilize Guardians for the same purpose as the Ahamkara. The Ahamkara were said to be wish-fulfilling "dragons", and were sought after by many Guardians for the paracausal gifts they granted. After much debate it was decided that the bargains made with these creatures came at too high a price, beginning a Great Hunt in which the Ahamkara were made all but extinct. Survivors are rumored to have been spotted as far out as Jupiter and Io Currently, the only known survivor is Riven, formerly raised under Mara Sov who was then Taken by Oryx, now serving under Savathûn. Ahamkara bones were subsequently incorporated into charms and new varieties of armor. These were known to cause auditory hallucinations in their bearers, as if the bones were speaking to them. The Ahamkara draw upon their wish-granting abilities from the Anthem Anatheme to transform desire into reality to suit one's purposes, using a characteristic phrase when addressing other beings, taking the form of "O/Oh (subject) mine". This phrase is apparently a curse, invoking paracausal powers of ownership over the addressee. The Worm Gods and the Cabal Emperor Calus have also been recorded as using this same phrase, suggesting either a relationship between the three or a universal applicability of this phrase. The Awoken have had extensive experience with the Ahamkara, with some rumors claiming that the Awoken discovered them living within the rocky planetoid that was used to build the foundations of the Dreaming City. The Techeun Shuro Chi, however, suspected that the Ahamkara originally were sent by the Nine. In the course of their dealings with Ahamkara, the Awoken learned that mirrors and other reflective surfaces can be used to see through an Ahamkara's illusions, leading them to strategically place polished, reflective geodes as countermeasures in certain areas of the Dreaming City. "THE DRAGONS. Our gods should be ours alone. Their smug freedom is an insult to me. I’d shut them all in cells. Bring them to me! " Possible references to the Ahamkara are found in the Hive's Books of Sorrow; the Harmony are described as having "wishful bishops" that make use of "dragon-wishes." Xivu Arath noted the Harmony's relationship with "the dragons" with outrage, and demanded their imprisonment. Notably, the Harmony had previously been visited by the Traveler. The Ahamkara first appeared in the Sol System following the Traveler's arrival; several sources describe them as being part of the "neolife" that was generated by the Traveler's actions, but their exact origins are unclear. Cayde's Treasure Island Book indicates they were studied by the Ishtar Academy during the Golden Age; the Awoken claim they were first to discover the Ahamkara after the Collapse, well before they ever came to Guardian attention. The first Ahamkara to be found by the Awoken was a young Riven, brought to the Queen by her brother, in search of a power that would allow them to build an Awoken city in the Reef. Riven's wish-granting abilities, along with those of other Ahamkara, played an integral role in the construction of the Dreaming City. While most of the Ahamkara preferred the worlds of the inner system, they passed freely through the Dreaming City, coexisting with the Awoken. Riven was the city's only permanently residing Ahamkara. Though the Awoken and the Ahamkara enjoyed a constructive relationship, the former soon learned to be wary and careful when dealing with the latter -- all Ahamkara were tricksters, and fundamentally self-interested. The Ahamkara were known to the Guardians during the City Age, and many Guardians made bargains with the creatures in order to reach greater power and fulfill other desires. It was ultimately decided that the prices of these bargains were too great, and the Vanguard ordered that the Ahamkara be exterminated in an event that became known as the Great Ahamkara Hunt. During this time, the Ahamkara had congregated on Venus, where they appeared to be engaged in some form of terraforming endeavor. According to Eris Morn, no two eyewitnesses could agree on what the nature of this terraforming project was, or in what order the relevant events had occurred. A paracausal phenomenon was observed to have manifested over the site of the Ishtar Academy, and induced suicidal actions in at least one observing Guardian. In response to the growing chaos, the City asked the Reef for assistance, and received a great deal of weaponry on loan. Mara Sov's generosity had ulterior motives: she had trapped Riven in the Dreaming City, and saw advantage in possessing the only living Ahamkara. Eventually, the Ahamkara were hunted down and seemingly rendered extinct in the Sol system. Riven was the only known survivor. At the onset of the Taken War, Oryx, the Taken King invaded the Dreaming City, Taking Riven in the process. This event drove the Nine into a frenzy, as they feared that Oryx's power would become too great to face with an Ahamkara to serve him. Communications between the Nine during this time seem to suggest that the Nine knew of additional Ahamkara within the Sol System, and that they killed them in order to prevent them from falling into Oryx's hands as well. After Oryx's death, Riven was left directionless, until Savathûn, the Witch-Queen visited Riven and took control of her. Riven, desiring to escape from the Dreaming City, manipulated Uldren Sov into opening a portal to the Dreaming City from the Tangled Shore, from which Riven sent the Voice of Riven. However, the abomination was soon slain by the Guardian, denying Riven any chance of leaving the Dreaming City. After the Guardian entered the Dreaming City, Mara Sov ordered the Guardian to slay Riven and tear out her heart. 6 Guardians would then Raid the Awoken watchtower in the Dreaming City, where Riven was trapped. After a fierce battle, Riven was slayed and her heart cleansed by the Techeuns Kalli and Shuro Chi. However, feeding off of the power from granting a wish to 6 elite guardians, Riven was able to grant one last wish, causing the Dreaming City to be trapped in an endless 3-week Cycle. With the death of Riven, Ahamkara are no longer present in the Sol system. Whether they are truly extinct or not remains to be seen. Ahamkara are shape-shifters, seemingly capable of taking on any form they desire. Most often, they seem to prefer dragon-like or serpentine forms, hence the name "wish-dragons". They are known to alter their forms in response to the expectations of their viewers; when Riven encountered the Guardian Savin, for example, she responded to his preconceptions by shifting into a more monstrous form. At various points, Riven was also known to adopt the shapes of a winged and crested beast, a "needle-nosed basilisk," or an antlered creature with tiger's paws. 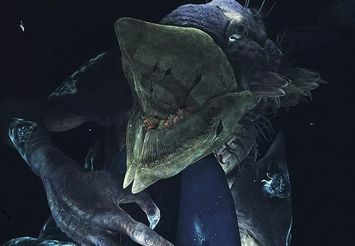 After her Taking and corruption of the Dreaming City, Riven manifested to the Guardian as an enormous serpentine, clawed and tentacled creature, with a fanged head covered in numerous eyes and protected by folding bone plates. Other Ahamkara are recorded as having adopted the forms of other species, such as humans or Vex, in the course of fulfilling various Guardians' wishes. Ahamkara vary greatly in size, an effect caused both by growth and their shapeshifting nature. When Riven was young, she was small enough to fit in one of Uldren's hands; as time passed, she grew so large her head alone was sometimes the size of a Pike. The Ahamkara Azirim grew in size after influencing and leading a large number of Awoken to their deaths, perhaps a result of having fed upon their desires. Perhaps as a result of their shapeshifting abilities, Ahamkara skeletal remains display great diversity in size and form. Ahamkara skulls, for example, may feature two, four or no eye sockets, may or may not have horns, and exhibit a range of different tooth shapes. A consistent feature appears to be a split lower jaw, not unlike a pair of arthropod mandibles. Ahamkara appear to have a central core, referred to as their "heart", that may be extracted upon their death. In the case of Riven, this heart took the form of a spherical "bubble" enclosing a compressed pocket of space, which can be entered by Guardians. During the process of extracting Riven's heart, a Guardian within the heart may observe a pair of massive hands in the distance, presumably belonging to the Guardian who is holding the heart. The existence of this "heart" curiously parallels the "ravenous heart" of Oryx, the Taken King, which persisted beyond his death and lives on within the weapon Touch of Malice, and that of Nokris, Herald of Xol, which was bequeathed to Xol in exchange for forbidden knowledge. "I came to find you, only you, because you're special. You're from somewhere real. And together we can burn our way back there. Can't we, o player mine?" The fossilized remains of the Ahamkara are of continued interest to Warlocks, who adorn their armor with them and thereby acquire unique powers. Some Hunters and certain Titans also wear armor with Ahamkara bones, but have less of an understanding of the risks involved. The bones seem to retain a will of their own, flattering and urging their owners to recklessness. Concept art depicting Guardians hunting Ahamkara. There is evidence that suggests Ahamkara were hunted earlier, as Lord Gheleon possessed many Ahamkara fragments. The name "Ahamkara" comes from the Sanskrit term for attachment to one's ego. Some players believed that the winged, flying creatures seen in the skies above Venus may have been living Ahamkara. According to Bungie, these creatures are "batadactyls". They got their informal name during an argument between members of Bungie's environment team over what animal the creatures most resembled. This led to the misconception that the Ahamkara were predominately found on Venus. It seems to be that the Ahamkara are aware of Destiny being a video game. In Destiny 2, the lore tab for Skull of Dire Ahamkara suggests that it speaks directly to the player of the game, and the Claws of Ahamkara suggest that they are trapped in a prison behind a screen. An intentionally unused lore entry strongly suggests that Ahamkara can view the actual development of Destiny through concepts relating to the Anthem Anatheme, and tell when the player of the game finds things that are not intended to be available in-game. However, its canonicity cannot be verified. It has been theorized that Ahamkara are closely related to, if not the same species as, the Worm Gods, given their similar attributes and use of the phrase "O [subject] mine". This was later suggested not to be the case by the craftmind Medusa (who may in fact be Eris Morn) in a lore entry, who hypothesized that both species separately evolved to harness the underlying power within the phrase. Given that this lore series continually changes the stated identity of the person delivering the information, the validity of this information may be suspect.